We’re in the business of making kids feel special. Aplausos especiales do just that! In my class, when someone does something particularly awesome, we reward them with a Special Applause. What merits a Special Applause? Chadcito won the state wrestling tournament, so of course, aplauso especial. Molly rapped the fast part of Soy Yo and impressed us all, so aplauso especial. Maureen bought donuts to share with the class. Obvio, aplauso especial. An Oscar Worthy performance… the best dancer of Baile Viernes…the kid who brought his trumpet to class and played (tried to play!) La Bamba- you guessed it…APLAUSOS ESPECIALES! My favorite is when the kids suggest that someone deserves a special applause without any prompting from me- it makes my heart swell with happiness. Once, after my student teacher taught one of her first lessons, someone insisted on giving her a special applause. My first year of teaching I taught at an elite boarding school. It was miserable! The worst experience of my adult life! I can’t emphasize this enough: it was really, really awful. But, there was one good thing: I asked the headmaster to send me to a TPRS training and he obliged. I spent a few days soaking up all things Susan Gross…And that’s where I learned about Aplausos Especiales. She taught us the “4th of July Applause” because someone in the audience did something great, so we recognized his greatness. And I was hooked! I thought: What fun! What joy! That’s coming home with me! Are these too childish for high schoolers?! NO WAY! THEY’RE GOING TO LOVE THEM! They will love them! And here we are, 14 years later, and I am still loving the aplausos especiales. It’s just another way to spark joy, just another special touch that sets Spanish class apart! 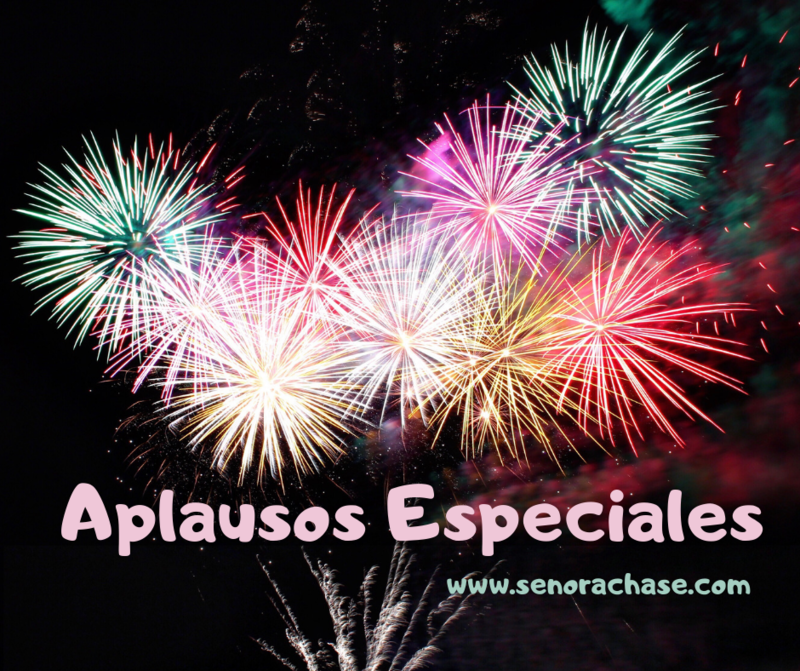 The Día de Independencia Applause is Susie’s… all the rest I made up and have become a part of our class culture. Print out my signs, or make up your own!Hand them up so you’ve got a visual to remind you and help them make their selection. (And if you teach at my school- Hi Amy, Karl, Becca and Barbara…invent your own so yours are new and fresh and fun to make your class special!) The more ridiculous, the better! So…. wanna see them? Brace yourselves, they’re pretty ridiculous! Next Verb charts?! In a CI classroom?! Is that even allowed?! Thank you for sharing these! Just the thing to add some fun to the final months of school! Loved the way the video shook when the students stomped during the Aplauso del pirata! ¡Jaja! HAHAHA I know! My portable really gets wild when we start dancing…we don’t have a very firm foundation!